And there’s another reason to drink Westcott Bay Cider: it’s made locally on San Juan Island. Recently, Rich gave me a tour of his Westcott Bay orchard and cidery and described the art of cider making. 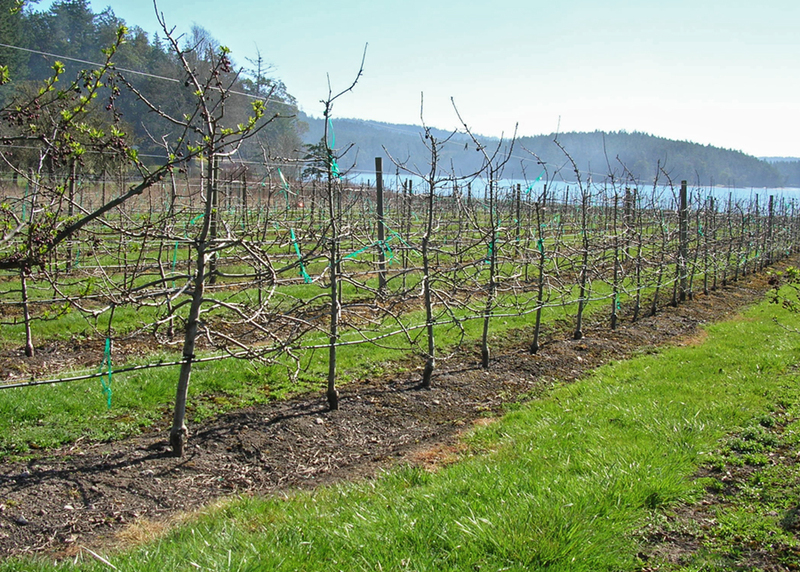 When he retired from Boeing in the mid-1990s, Rich replanted the old two-acre orchard on his Westcott Bay property with 1000 cider apple trees. Kingston Black, Yarlington Mill, Dabinett and Sweet Coppin are just a few of the sixteen varieties he selected. They’re in rows running west down toward the bay and trained in a spindle technique—one central leader with lateral branches—to keep the closely planted trees both productive and easy to pick. “I don’t want to deal with ladders at my age,” Rich said, laughing. “You have wineries, so why not cideries?” Rich asked as we walked into the building where he makes his cider. From a spigot near the bottom of one stainless steel fermentation tank, Rich drew us glasses of his driest cider. It’s English-style cider: dry, light, and slightly effervescent. I could drink a lot of this. An engineer, Rich delights in showing the equipment he’s bought, modified or made to transform his apples from just-picked fruit into this traditional beverage. There’s an apple scrubber—a shallow, horizontal tank that uses running water and brushes to clean the apples; a stainless steel crusher that he describes as an overgrown Cuisinart to chop the apples; and a press to squeeze juice from the crushed apples into a wheeled tub below. Finally, there’s an ingenious pasteurizer that holds eight plastic milk crates of bottled cider and floods them with 140 degree F. water and a last, much smaller device: a wooden labeler that gently rolls labels onto the finished bottle of cider. “You can sit here all day and roll on labels.” Rich said, smiling.